The UN's nuclear watchdog has said Libya managed to produce a small amount of plutonium using technology acquired on the black market. The International Atomic Energy Agency report did not specify the amount, but said it was not enough to make a nuclear bomb, diplomats said. 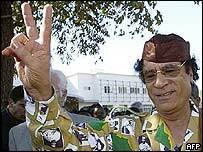 In 2003, Libya said it was abandoning plans to develop nuclear weapons. The agency has been overseeing the removal and destruction of equipment used in the clandestine programme. The report said Libya secretly imported enriched uranium which it converted into plutonium, and engaged in other activities aimed at producing a nuclear weapon. The IAEA said Libya's failure to report on its nuclear programme from the 1980s to 2003 "shows that over an extended period of time Libya was in breach of the... safeguards agreement" - part of the Nuclear non-Proliferation Treaty aimed at stopping the spread of nuclear weapons. The report also said Libya's nuclear programme "relied heavily on support from foreign sources". Plutonium and highly enriched uranium are two substances used in the warhead of a nuclear bomb. The US and UK intelligence agencies previously said Libya's nuclear programme was fairly advanced, while the IAEA said it was in its early stages. The report was prepared by IAEA director Mohammed ElBaradei, ahead of a meeting of the agency's board of governors next month. Mr ElBaradei will travel to Libya next week to meet Libyan officials and review the progress of the disarmament work. In a separate development, it has emerged that the alleged financier of disgraced Pakistani nuclear scientist Abdul Qadeer Khan told Malaysian police that Mr Khan had sent enriched uranium to Libya. The Malaysian police report on Friday also alleged that several European businessmen were involved in supplying Libya with nuclear technology.